Master the art of effective communication and you will unlock the door to success. Whether you are a leader, a manager, a sales representative or a parent, the ability to communicate and "connect" with others is indispensable. 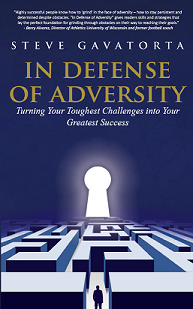 Steve Gavatorta, creator of The Reach Out Approach, is a Master Communication Coach. Through his years of experience in consulting and training leaders, managers, executives, sales professionals and more he has developed a foolproof system for anyone who wants better results in business or life. The Reach Out Approach is a simple but powerful set of principles and tools to help you understand yourself and others like you never have before. Using this knowledge and Steve’s specific tools, you will be able to connect with people like never before. "Very readable, highly practical guide for anyone who wishes to become skilled at connecting with others...Make this your handbook for success in human relations." With The Reach Out Approach, you will increase your sales, empower your people, enhance your relationships and get the breakthrough results you really want! Praise for "The Reach Out Approach"
It’s been said people are unsuccessful because they build walls instead of bridges. Steve Gavatorta's important book shows specific ways to build bridges by Reaching Out to people so we make genuine connections that are a win for everyone - on and off the job. Read it and reap. Red-carpet service is about making the individual in front of you feel important and special. In this high tech, low touch world, Steve Gavatorta’s “reach out and connect” approach is a refreshing way to do exactly that. An easy and fun read, The Reach Out Approach teaches us how to personalize our communication style and build the kind of relationships that make for a more productive team, enthusiastic customers, and a happier home! Human communication is either your best friend or worst foe. 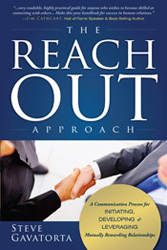 The Reach Out Approach is a must read and provides a simple, straight forward path to meaningful, productive relationships for business and life. Steve has done an absolutely phenomenal job. In today's fast pace world this book is very much needed. The Reach Out Approach brings us back to the base fundamentals of any successful person - mastering the art of effective communication. President & CEO, Prime Concepts Group, Inc.